Why might I need a complete blood count? What does a complete blood count measure? White blood cell differential. A white blood cell differential measures the number of each type of white blood cell. There are 5 major types of white blood cells, and each type plays a different role in protecting the body. Your doctor can learn valuable information about your health by measuring the levels of these cells. Your health care team must carefully interpret CBC test results. Keep in mind that many factors, including noncancerous conditions, can lead to results that fall out of the normal range. Ask your doctor to help you understand what your results mean. Low white blood cell count. Some cancer treatments, mainly chemotherapy, may cause a decrease in your body's white blood cells. Cancers that affect the blood and bone marrow can also cause a decrease in the count. These types of cancers include leukemia, lymphoma, and multiple myeloma. Amounts of different white blood cells. Higher-than-normal numbers of lymphocytes or monocytes can indicate the possibility of certain types of cancers. Some cancers and their treatments may cause neutropenia. Neutropenia is a decrease in the number of neutrophils, which increases the chances of a bacterial infection. At times, your doctor may lower your chemotherapy dose to reduce your chance of developing a low neutrophil count. Your doctor may also recommend medication, such as white blood cell growth factors, to increase your body's production of neutrophils, especially if you develop a fever. Learn more about the use of white blood cell growth factors. Low red blood cell count. Some cancer treatments, mainly chemotherapy and radiation therapy, may cause a decrease in red blood cells. This condition is known as anemia. Blood loss, either from surgery or specific cancers, and cancers that directly involve the bone marrow can also cause or worsen anemia. People whose red blood cell count falls too low may need a blood transfusion or medication to help increase it. Low platelet count. Some cancer treatments, such as chemotherapy or radiation therapy, may cause a decrease in platelets. Cancers that directly involve the bone marrow can also cause a decrease in platelets. An unusually low number of platelets is called thrombocytopenia. Patients with low platelet levels have a greater risk of serious bleeding or bruising. If your platelet count falls to very low levels, your doctor may recommend platelet transfusions. How and where is this test done? Do I need to avoid eating and drinking before the test? If so, for how long? How will I get the results of my test? What are normal test results? What do my test results mean? Will someone help explain them to me? If my results are within a normal range, what are the next steps? If my results are outside of a normal range, what are the next steps? How do these test results compare with my previous results? Will I need additional tests? If so, when? 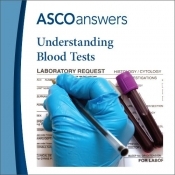 Download ASCO's free 1-page (front and back) fact sheet on Understanding Blood Tests as a printable PDF. Order printed copies of this fact sheet from the ASCO University Bookstore.